For 2017, I decided that part of my New Years resolutions would be to take better care of my skin. I have certainly been behind in that department as I've been forgoing my skincare routines, not drinking enough water, and sleeping late. So, as part of fulfilling this skincare resolution, I made my first visit to One Skin by Dermatologists at Madison Galleries, Alabang Hills (perfect for my friends in the south!). One Skin specializes in facial treatments that are non-invasive, using the Exilis technology - a non-invasive method for tightening skin by enhancing the production of collagen remodeling with no patient recovery or down time. Since I was a new client, they did a skin analysis where I filled out a form so that the doctor could have an idea of what skin type I had and what I thought were my areas of concern, and then recommend a treatment for me. I had a consultation with Dr. Lyra and was recommended the Silk Peel Facial - a light facial that refreshes, gently exfoliates, and delivers customized, rejuvinating solutions straight to the skin. It is outfitted with a diamond-tip head to ensure that you get the most out of this advanced microdermabrasion treatment. 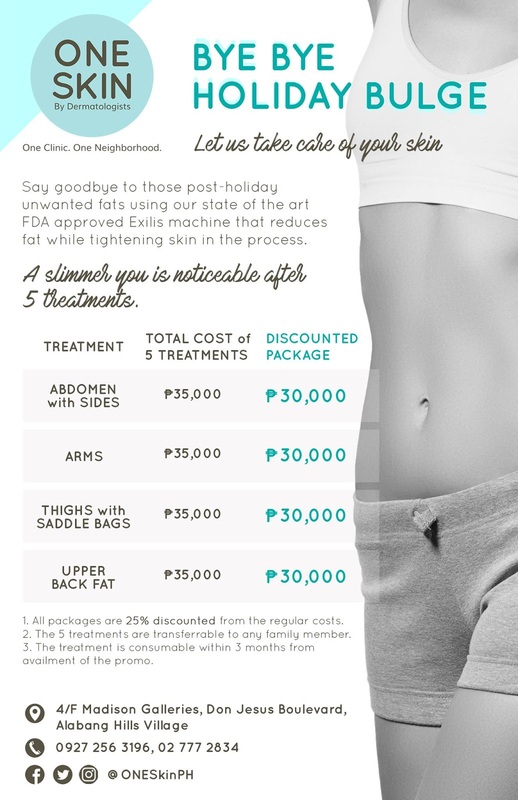 The Silk Peel Facial is available at One Skin clinic starting at P1,500 only. What I also appreciated about the One Skin clinic is that their rooms were quite spacious and clean. Other skin clinics I have been to are a bit smaller and tend to be difficult to move around in. I felt very comfortable during the treatment. If looking after your skin is part of your New Year's resolution too, you can visit One Skin by Dermatologists at Madison Galleries in Alabang Hills. They also have a holiday promo running right now for their other services, so visit their Facebook Page for more info on these services.